According to MacRumors Wal-Mart 8GB iPhone 3G model will be selling for $197 at Wal-Mart, two dollars less than other retailers. Wal-Mart has already been selling G1s for $148.88, or about $31 less than wireless carrier T-Mobile is charging for the same phones. 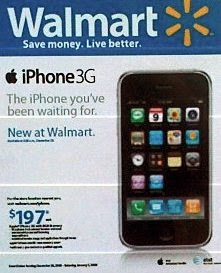 8GB iPhone 3G will go on sale at Wal-Mart at the end of December.